Stacking => 4 x 2 elem. vertical produce 13.5 dBi at a HPBW of 71 degr. 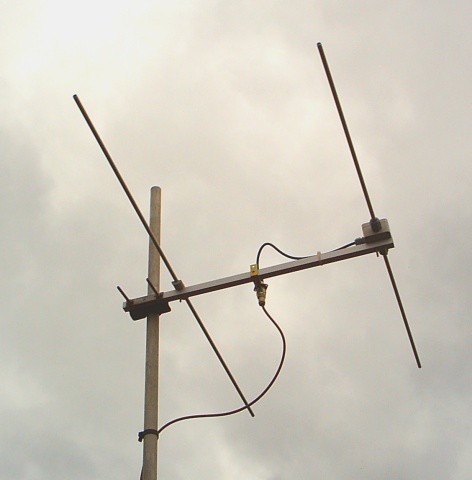 This little Yagi is as much bandwidth as can be. A forgiving and easy to build alternative to the HB9CV. a high F/B does not help much. And note that the HB9CV's true gain is around 4.15 ... 4.2 dBD. No more then that. Quarterwave Line grounded with an N-cable-flange bushing. 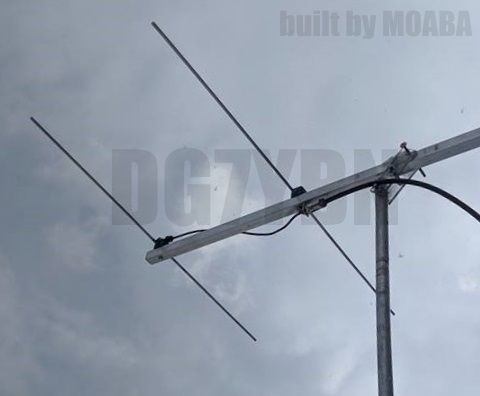 mode with this small Yagi. Record so far is a FT8 rx report over 648 k by DK0IZ in JO43sx. -3 dB H-plane        133.2 deg. -3 dB E-plane         69.6 deg. Pos. 1/2 Length  BC 20x20   BC 25x25     BC 1x1"
ele. 8 mm   ele. 8 mm   ele. 3/8"
The Dipoles diameter is 10 mm for all examples. Use EZNEC's Auto-Segmentation at 144.3 MHz. all ready to use measures due to impedance interaction at that close distance. -3 dB H-plane         45.8 deg. -3 dB E-plane         72.2 deg. Note the different element positions and lengths of the inner Yagis - see drawing below. -3 dB H-plane         21.2 deg. -3 dB E-plane         71.0 deg. HBW is a little wider, F/B almost similar. But as 4 x 2 ele. probably more handy for portable use. The DK7ZB 4 x Quadlong is less high, just 2.85 m compared to the 3.9 m of the 4 x 2 element. The 4 x Quadlongs gain is 2.1 dB less while F/B of the 4 x Quadlong is 2.2 dB higher.